HÀ NỘI — A handbook titled “Respect! 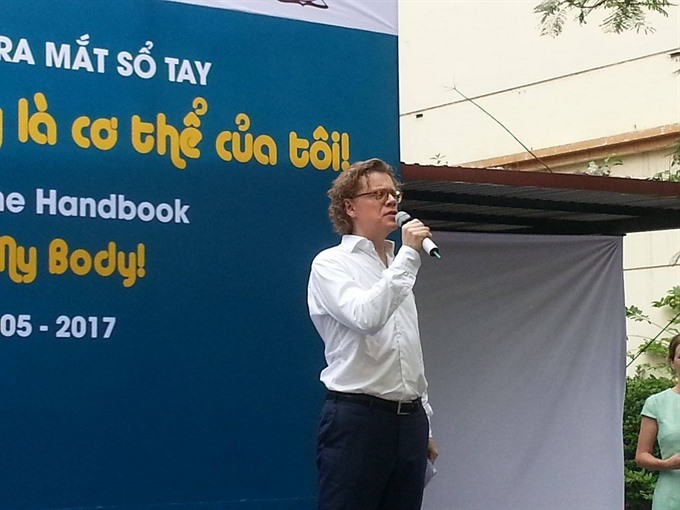 My Body!”, a guide for adults and teachers to talk to children about body boundaries and sexual abuse, was launched on Tuesday in Hà Nội. The event was organised jointly by the Swedish Embassy, Save the Children in Việt Nam and Việt Nam Programme for Internet and Society. Released by Save the Children Sweden as part of an integrated child sexual abuse campaign, the handbook offers advice and tips to adults, especially parents, on how to teach children of different ages to protect themselves from sexual abuse and how to speak openly about sexuality, private body parts, safe and unsafe touching, and what is and is not permissible when adults touch children. The handbook is already available in Swedish, English, Spanish and Arabic, and now, for the first time, it has been translated into Vietnamese. Speaking at the event, Đặng Hoa Nam, director of the Department of Child Care and Protection under the Ministry of Labour, Invalids and Social Affairs, said Việt Nam is the first country in the Asia and the second country in the world that ratified the Convention on the Rights of the Childs (CRC) in the early 1990s. The implementation of the CRC was formalised under the Law on Child Protection, Care and Education (LCPCE), which was approved by the National Assembly in 1991.